Digital Signage, today, has had a colossal impact on marketing and advertising. Its applications and uses are equally spread in public, as well as private environments such as transit systems, campuses, government institutions, corporations, banking, healthcare, and retail.Digital signage is used for displaying information such as news, weather report, commercials, announcements etc., Digital signage impacts a firm’s advertising and brand building indirectly by influencing customer behavior and even enhancing the customer experience.Businesses are facing cut throat competition, hence their overall approach has changed towards marketing and providing customer satisfaction; Now more businesses are concentrated more on providing a unique experience to their clients. 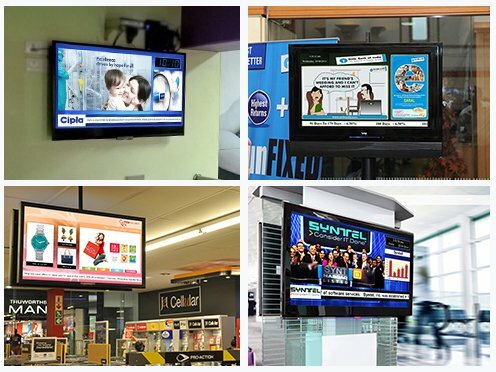 Xtreme Media understands individual business needs and offers one of the best end-to-end digital signage solutions. We have become the leading digital signage provider by expanding our technical capabilities and by creating innovative solutions. We provide a complete digital signage solution that includes hardware, integration, support & content management services, digital signage software, that helps you in on-site, as well as remote content management. Our digital Signage solution can handle different & multiple media sources such as flash, audio, video, and images. Besides, content scheduling, dynamic data handling, emergency/instant messaging, live monitoring and many other such rich features have made Xtreme Media’s Digital Signage Solution, the first choice in the market. In 2012, we successfully implemented the biggest digital signage project in India, with the STATE BANK OF INDIA. Our digital signage solution was utilized across the 2000+ branches & ATM’s all over India, which helped SBI in showcasing campaign videos, images, RSS Feeds of currency rates, gold rates, etc. which can be controlled and updated centrally. Some of our major projects have been with NSE, the Indian Railways, Pure Gold Jewellers, Forever Living, VFS Global and many more . Our digital signage products also include stock exchange ticker, digital kiosks, digital menuboards, and digital brochures. Xtreme Media serves various sectors such transportation, healthcare, automotive \industry, BFSI, hospitality, retail, and cinema theaters with the best in class digital signage solutions and has become a trusted name in the Market.